Milan Italy is considered one of the world's most important fashion centers and there is good reason for it as many famous designers started their careers in Milan as well as others finishing their careers. 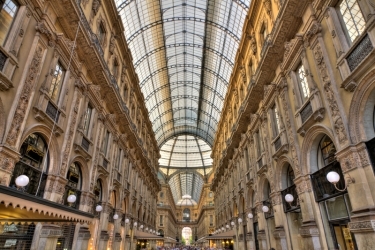 Milan also has one of the largest areas in Italy to shop for fashion and is known as the Golden Quad. In this area you will find boutiques caring fashions from world famous designers as well as many cafes and restaurants where you can get a bite to eat in order to have enough energy to keep shopping or at the end of a long shopping day. Either way there are plenty of places to sit, relax and have a meal. One of the more interesting places to shop is a huge complex next to the Duomo Di Milano in the Piazza de Duomo. Very interesting place as they enclosed the streets above with a glass roof so you can walk around the many shops and restaurants without ever having to worry about rain. Many people go into this complex just to look at the amazing architecture. Shopping and looking at high fashion isn't the only thing to do in Milan as there are many wonderful things to see and do. As mentioned earlier a great place to shop in located in Paizza de Duomo and what else is in the piazza but the famous Duomo of Milan. This cathedral's is build in the gothic style and is one of the largest churches in the world. It's beautiful and interesting exterior with spires seemingly everywhere is something you will talk about for some time and the interior is equally interesting as there are over 3000 statues inside. However don't expect to see life size statues of everything as most of the carvings are on the many pillars holding up the church and many others are reliefs. One thing most people don't know about the Duomo it that you can walk around on the Duomo's roof where if it happens to be a clear day you can get a great view of the mountains off in the distance. A must see place in Milan is the church Santa Maria delle Grazie because it is where the Leonardo da Vinci painting the last supper is. I believe this painting has be reproduced so many times by different artists that many people don't realize it is actually painted on a wall in the church. One interesting thing about the painting is many art experts don't consider it a fresco because it was painted on a dry wall, since I am not a art historian I don't know what difference it makes but it must otherwise it wouldn't be a topic of discussion. As this painting is one of the most visited things in Milan if you want to see it I would advise anyone to get tickets well in advance as there is a limited number of people allowed in each day and during the summer it could be sold out for months. Milan isn't really known for its museums but still has many world class examples and one of them is Pinacoteca di Brera. Most of Milan's museums aren't on the large side which is the case with this museum but once inside you will find mostly paintings by many famous Italian artists such as Raphael, Rembrandt and Tintoretto. One of the pleasant things about this museum is its location as it is in the Brera area of Milan which is a wonderful place to wonder around and look at the neat shops and the architecture , you may also want to stop in one of the local cafe's for a bite to eat as well as doing some souvenir shopping as this area of town has better prices then others. If you are an opera buff you might want to visit the world famous La Scala which is a museum dedicated to opera as well as being an operating opera house. Built in the late 1770's its first performance was in August 1778. Many of the world's most famous singers have appeared on stage here as well as dancers as the theater also hosted many ballets as well. Not only is the La Scala famous for its performances but for its interior as well as it is one of the most beautiful in theaters Europe. It might not be Venice but Milan still has a good number of canals to see as well as taking a ride, you won't find any gondolas in Milan but you can still catch a ride on a water taxi. If you want to relax by taking a nice long walk next to a canal or have lunch or dinner at one of many canal side restaurants you shouldn't have any trouble finding one. One thing people wouldn't expect to see in Milan at least I didn't is an aquarium and Milan has a nice one. It is one of the largest aquariums in Italy and has over 35 pools with well over 100 different kinds of fish. Some pools have fresh water in them and housing fish from as far away as the Amazon and other are saltwater pools having beautifully colored tropical fish. Milan can also be a great base from which to go on many day trips as one of Italy's most visited lakes which is lake Como is only about 50 miles away and easily accessible by train. Another place to go that is very close is the town of Monza which is only about 10 miles away and depending on when you are vacationing you could attend a formula one grand prix as Monza hosts a round every year. Also if you are looking for a long day trip or a different place to spend the night it is a short 3 hour train ride to Venice and even thought they are so close and in the same country they are completely different kinds of towns. If after spending a full day shopping you feel like a nice long day at the beach to relax Genoa is less the 2 hours by car or train so being in Milan one can have almost endless possibilities of things to do and other places to visit. If you have any interest at all in going to any of these places a great place to start would be Viator which is one of our partners. 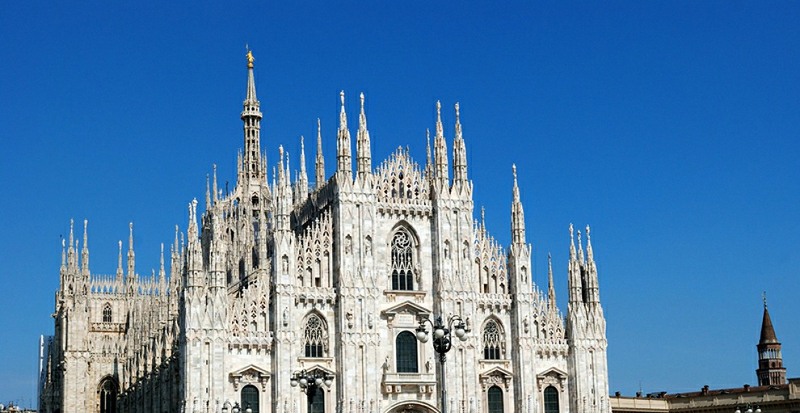 Viator is the largest tour booking company in Europe and they have many different types of tours to go on from Milan as well as in Milan and this could give you a much easier way to decide if you want to do something away from Milan while in Italy. To look up tours and pricing either click on Viator or the banner on the right.